And now I have to try to retrieve the novel Life and Fate which I lent to a friend two years ago before I had read it myself! Recently I finished (pictured, front) Vasily Grossman’s A Writer at War culled from the notebooks he used as a war correspondent for Red Star, the Red Army newspaper. 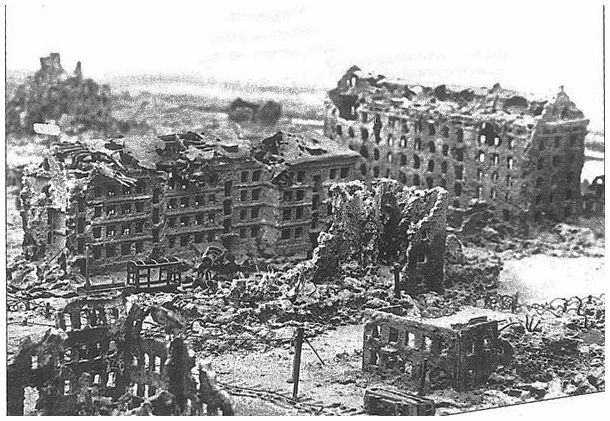 In it he writes about the war on the Eastern front, the German defeat at Stalingrad (pictured, above) and the Russian advance on Berlin. But it is told from many perspectives so that we have a fly on the wall insight into what he calls the ‘the ruthless truth of war’. His frontline reports were censored of any negative or questioning comments and were thus marshaled to support the fighting spirit of the Russian forces and depict the soldier as the epitome of bravery and selflessness. His notes on the brutality of that army and the rapes many soldiers carried out as they charged across Germany were, of course, suppressed. The prospect of being mutilated or becoming a cripple always represented a far greater fear for Soviet soldiers than being killed. There was of course the unshakeable belief that a woman would never want to look at them again. This may have been a misleading male nightmare, but the true awfulness of their fate did not become apparent until after the war when maimed and crippled Red Army soldiers were treated with unbelievable callousness by the Soviet authorities. Those reduced to a trunk with stumps were known as samovars. After the war they were rounded up and sent to towns in the Arctic Circle so that the Soviet capital would not be made unsightly with limbless veterans. During the advance on Germany Grossman was accompanied by a friend Aleksei Kapler, the film director, who became the first love of Stalin’s daughter, Svetlana. When Stalin discovered the affair he had Kapler beaten up by the secret police and sent to the Gulag for ten years in 1943. Grossman was attached to the most popular of all Zhukov’s commanders, Colonel-General Berzarin who became commandant of Berlin because his troops had been the first into the city. Berzarin did not even wait for the fighting to finish. He made every effort to have essential services restored as soon as possible – a huge task after the destruction – and to make sure that the population did not starve. Many Berliners worshipped him, and when he was killed a few weeks later in a motorcycle accident, rumours spread that the NKVD had assassinated him. Grossman’s novel Life and Fate was finished in 1960 and has been described as one of the greatest novels of the twentieth century. The Russian censor, having read it, said it couldn’t be published for 200 years! KGB officers seized every copy of the manuscript (including the carbon paper and typewriter used in its writing). Or so they thought. One had survived in the house of a friend who had put it in a canvas satchel and left it hanging on a hook under some coats at his dacha. Eventually the manuscript was discovered and sent to the West where it was published to acclaim.